Originally, many tank installations were of steel on sub-standard or unsightly foundations which today represent a high pollution and environmental risk without taking into account the inconvenience of clearing up a spill. With strict legislation in place for new tank installations, the Heat Demon can install new compliant fuel tanks, with the option of fitting the excellent Watchman Sonic fuel measurement systems. 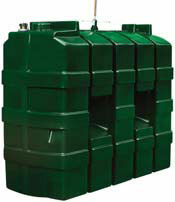 Current tanks are of sturdy plastic construction, offering years of trouble free service. Tanks can be supplied as either single skinned or bunded depending on site inspection.